This picture shows complicated coal workers pneumoconiosis. There are diffuse, massive light areas that run together in the upper and middle parts of both lungs. These are superimposed on a background of small and poorly distinguishable light areas that are diffuse and located in both lungs. 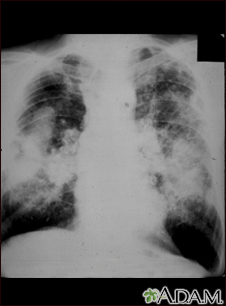 Diseases which may explain these x-ray findings include, but are not limited to: complicated coal workers pneumoconiosis (CWP), silico-tuberculosis, and metastatic lung cancer.